Pain is the most common reason for patients seeking advice from health professionals. It is one of the most frequent presenting symptoms of different pathologies and represents important medical and economic costs for the community. Current analgesic therapies, despite their proven efficacy in alleviating symptoms and providing pain relief, all have considerable side effects including gastrointestinal problems, renal damage, respiratory depression, emesis, and tolerance and/or addiction. In addition, many pain sufferers are not satisfied with their pain care and this makes the search for new analgesics that can more effectively treat pain, an important challenge to drug research. Medicinal plants are believed to be important sources of new chemical substances with potential therapeutic efficacy. Considering that the most important analgesic prototypes (e.g., salicylic acid and morphine) were originally derived from plant sources, the study of plant species traditionally used as analgesics should still be seen as a useful research strategy in the search of new analgesics. In spite of the many uses traditionally, there is little scientific evidence in literature on the effect of this plant on experimental pain. This study therefore examined the antinociceptive effect and possible mechanism of action of the ethanolic extract of the aerial parts of H. latifolia in animal models. The current study will help to substantiate the traditional uses of H. latifolia as well as provide an alternative to current analgesics. The aerial parts of H. latifolia were collected from the campus of Kwame Nkrumah University of Science and Technology (KNUST), Kumasi, near the Botanical Gardens (06°41′12.89′N; 01°33′59.51′W) during the month of July, 2007, and authenticated by Mr. George H. Sam of the Department of Herbal Medicine, Faculty of Pharmacy and Pharmaceutical Sciences, College of Health Sciences, KNUST, Kumasi, Ghana. A voucher specimen (KNUST/HM1/09/L029) was kept at the herbarium of the Faculty. The plant was room-dried for 7 days and pulverized into a fine powder. The powder was extracted by cold percolation with 70% (v/v) ethanol and then concentrated into a green syrupy mass under reduced pressure at 60°C using a rotary evaporator. It was further dried in a hot air oven at 50°C for a week and kept in a refrigerator for use. The yield was 19.67%. This crude extract is subsequently referred to as the H. latifolia extract (HLE) or extract in this study. Male ICR mice (15-25 g) and male Sprague-Dawley rats (100-195 g) were purchased from the Noguchi Memorial Institute for Medical Research, Accra, Ghana, and kept in the animal house of the Department of Pharmacology, Kwame Nkrumah University of Science and Technology, Kumasi, Ghana. They were housed in groups of 5 in stainless steel cages (34 × 47 × 18 cm 3 ) with soft wood shavings as bedding, fed a normal commercial pellet diet (GAFCO, Tema, Ghana), given water ad libitum, and maintained under laboratory conditions (temperature 24 ± 2°C, relative humidity 60-70%, and 12-h light-dark cycle). The studies were conducted in accordance with accepted principles for laboratory animal use and care (EEC directive of 1986: 86/609 EEC). All protocols used were approved by the departmental ethics committee. The following drugs and chemicals were used: formalin, acetic acid, and theophylline (BDH, Poole, England); diclofenac (KRKA, Slovenia); morphine (PhytoRiker, Accra, Ghana); ondansetron (GlaxoSmithKline, Uxbridge, UK); glibenclamide (Daonil® , Sanofi-Aventis, Guildford, UK); nifedipine (Denk Pharma, Germany); and yohimbine, atropine, naloxone, NG -l-nitro-arginine methyl ester (l-NAME), l-glutamic acid, and capsaicin (Sigma-Aldrich Inc., St. Louis, MO, USA). This test was carried out as described previously , with modifications. Mice were treated with HLE (30, 100, or 300 mg/kg, p.o. ), diclofenac (10, 30, or 100 mg/kg, i.p. ), or vehicle (1 ml/100 g, p.o.) 30 min (i.p.) or 1 h (p.o.) before the administration of acetic acid and placed individually in a testing chamber (a Perspex chamber, 15 cm × 15 cm × 15 cm). A mirror angled at 45° below the floor of the chamber allowed a complete view of the mice. Each animal was administered with acetic acid (0.6 %, 10 ml/kg) intraperitoneally. Injection of acetic acid induced a nociceptive behavior, writhing, an exaggerated extension of the abdomen combined with the outstretching of the hind limbs. Responses were captured (30 min) for analysis by a camcorder (Everio TM , model GZ-MG1300, JVC, Tokyo, Japan) placed directly opposite the mirror and attached to a computer. Tracking of the behavior was done using public domain software JWatcher TM , version 1.0 (University of California, LA, USA, and Macquarie University, Sidney, Australia, available at http://www.jwatcher.ucla.edu/ ) to obtain the total number of writhes per 5 min, starting 5 mins after acetic acid administration. These data were expressed in a time course which enabled the observance of changes in the maximal number of writhing induced. A dose-response curve was also plotted to determine the significant antinociceptive dose. The tail immersion test was carried out as described previously  with modifications. This involved immersing the extreme 3.5 cm of the rat's tail in a water bath containing water at a temperature of 48 ± 0.5°C. The rat reacts by withdrawing the tail. The reaction time was recorded with a stop watch and a cut-off time of 15 s was imposed on this measure. Rats were randomly selected to perform in one of the study groups (five per group): control, diclofenac (10-100 mg/kg, i.p. ), morphine (1-10 mg/kg, i.p. ), and HLE (30-300 mg/kg, p.o.). The reaction time (Ta ) for the study groups was taken at 0.5, 1, 2, 3, 4, and 5 h intervals after a latency period of 30 min (i.p.) or 1 h (p.o.) following the administration of the drugs or extract. The percentage maximal possible effect (%MPE) was calculated from the reaction times using the following formula: [(T 2 - T 1)/(T 0 - T 1)× 100], where T1 and T2 are the pre- and post-drug-reaction times, respectively, and T0 is the cut-off time. The test was carried out as described previously , with a few modifications. Each animal was assigned and acclimatized to 1 of 20 formalin test chambers (a Perspex chamber, 15 cm × 15 cm × 15 cm) for 1 h prior to formalin injection. Mice were then pretreated with the test drugs (HLE, 30-300 mg/kg, p.o. ; morphine, 1-10 mg/kg, i.p.) 30 min (i.p.) or 1 h (p.o.) before the intraplantar injection of 10 μl of 5% formalin. The animals were immediately returned individually into the testing chamber and their nociceptive behaviors captured (1 h) for analysis in the same way as that described previously in the writhing test above. The pain response was scored for 1 h, starting immediately after formalin injection. A nociceptive score was determined for each 5 mins time block by measuring the amount of time spent biting/licking of the injected paw. Tracking of the behavior was done using public domain software JWatcher TM , version 1.0. The average nociceptive score for each time block was calculated by multiplying the frequency and time spent in biting/licking. Data were expressed as the mean ± SEM of scores between 0-10 mins (first phase) and 10-60 mins (second phase) after formalin injection. The procedure used was similar to that described previously  but with modifications. Before testing, the animals were placed individually in 1 of 20 transparent Perspex chambers (15 cm × 15 cm × 15 cm). Following a 1-h adaptation period in the chamber, animals were pretreated with HLE (10-300 mg/kg, p.o.) and morphine (3 mg/kg, i.p.) 30 mins (i.p.) or 1 h (p.o.) before intraplantar injection of 20 μl of capsaicin (1.6 μg/paw made in 10% ethanol, 10% Tween 80, and 80% saline). Control animals received vehicle (normal saline, 10 ml/kg) systemically before intraplantar capsaicin. The pain response (biting/licking of the injected paw) was recorded (10 mins) and scored (10 mins) in the same way as that described previously in the formalin test above. Data were expressed as the mean ± SEM of scores between 0 and 10 mins after capsaicin injection. The procedure was carried out as described previously , with modifications. Mice were acclimatized to test chambers and pretreated with HLE, morphine, or vehicle similar to that described for the capsaicin-induced nociception above. Twenty microliters of glutamate (10 μmol/paw prepared in saline) was injected intraplantarly in the ventral surface to the right hind paw of mice and immediately returned individually into the testing chambers. The nociceptive behavior (biting/licking of the injected paw) of the animals was then captured (15 mins) and later scored (15 mins) similarly to that described in the formalin test above. Data were expressed as the mean ± SEM of scores between 0 and 15 mins after glutamate injection. To investigate some possible mechanisms by which HLE exerts its antinociceptive activity, mice were pretreated with different drugs in the formalin test. The doses of antagonists, agonists, and other drugs were selected based on data from literature and preliminary experiments in our laboratory. Mice were pretreated with naloxone (a nonselective opioid receptor antagonist; 2 mg/kg, i.p.) and after 15 mins received HLE (30 mg/kg, p.o. ), morphine (3 mg/kg, i.p. ), or vehicle (10 ml/kg, p.o.). The nociceptive response to formalin injection was recorded 1 h after the administration of HLE or vehicle and 30 mins after the administration of morphine. Another group of mice was pretreated with vehicle and after 15 mins received HLE (30 mg/kg, p.o. ), morphine (3 mg/kg, i.p. ), or vehicle (10 ml/kg, p.o. ), 1, 0.5, and 1 h before formalin injection, respectively. Mice were pretreated with l-NAME (a NO synthase inhibitor, 10 mg/kg, i.p.) and after 15 min received HLE (30 mg/kg, p.o. ), morphine (3 mg/kg, i.p. ), or vehicle. The nociceptive response to formalin injection was recorded 1 h after the administration of HLE or vehicle and 30 mins after morphine administration. Mice were pretreated with glibenclamide (an ATP-sensitive K + channel inhibitor, 8 mg/kg, p.o.) and after 30 mins received HLE (30 mg/kg, p.o. ), morphine (3 mg/kg, i.p. ), or vehicle. The nociceptive response to formalin injection was recorded 1 h after the administration of HLE or vehicle and 30 mins after morphine administration. Mice were pretreated with theophylline (10 mg/kg, i.p., a nonselective adenosine receptor antagonist) and after 15 mins received HLE (30 mg/kg, p.o. ), morphine (3 mg/kg, i.p. ), or vehicle. The nociceptive response to formalin injection was recorded 1 h after the administration of HLE or vehicle and 30 mins after morphine administration. Animals were pretreated with ondansetron (0.5 mg/kg, i.p., a 5-HT 3 receptor antagonist) and after 15 mins received HLE (30 mg/kg, p.o. ), morphine (3 mg/kg, i.p. ), or vehicle (10 ml/kg). The nociceptive response to formalin injection was recorded 1 h after the administration of HLE or vehicle and 30 mins after morphine administration. Mice were pretreated with yohimbine (3 mg/kg, p.o., a selective adrenoceptor antagonist) and after 30 mins received HLE (30 mg/kg, p.o. ), morphine (3 mg/kg, i.p. ), or vehicle. The nociceptive response to formalin injection was recorded 1 h after the administration of HLE or vehicle and 30 mins after morphine administration. Mice were pre-treated with nifedipine [10 mg/kg, p.o., l-type voltage-gated calcium channel (VGCC) blocker] and after 30 min received HLE (30 mg/kg, p.o. ), morphine (3 mg/kg, i.p. ), or vehicle. The nociceptive response to formalin injection was recorded 1 h after the administration of HLE or vehicle and 30 mins after morphine administration. Mice were pretreated with atropine (5 mg/kg, i.p., a nonselective muscarinic receptor antagonist) and after 15 mins received HLE (30 mg/kg, p.o. ), morphine (3 mg/kg, i.p. ), or vehicle. The nociceptive response to formalin injection was recorded 1 h after the administration of HLE or vehicle and 30 mins after morphine administration. The formalin test was used to ascertain whether, after chronic treatment, tolerance develops to the antinociceptive activity of HLE and morphine. The procedure used was similar to that described previously. Mice were divided randomly into five groups (n=5) and treated once daily for 8 days as follows: three groups with saline i.p., one group with HLE 60 mg/kg, p.o., and one group with morphine 6 mg/kg, i.p. On day 9, these groups were treated in the following manner: one saline-pre-treated group was treated with saline i.p. ; two saline-pre-treated groups were treated with either HLE 30 mg/kg, p.o., or morphine 3 mg/kg, i.p. ; the group pretreated with HLE 60 mg/kg was treated with HLE 30 mg/kg, p.o., and the group pretreated with morphine 6 mg/kg was treated with morphine 3 mg/kg, i.p. HLE and morphine were administered 60 and 30 min before formalin injection, respectively. In a separate study, HLE was administered to animals chronically treated with morphine to establish whether morphine-induced tolerance cross-generalizes with HLE. This second experiment also investigated whether chronic concurrent treatment of mice with morphine and HLE will abolish the development of morphine tolerance. In the second study, two groups of animals (n=5) were treated once daily for 8 days with morphine 6 mg/kg, i.p. Another group (n=5) received both morphine 6 mg/kg, i.p., and HLE (60 mg/kg, p.o., 30 min before morphine) for 8 days. Three other groups of animals (n=5) received chronic dosing of saline i.p. also for 8 days. On day 9, animals treated with chronic morphine received either morphine (3 mg/kg, i.p., 30 mins before formalin) or HLE (30 mg/kg, p.o., 60 mins before formalin), whereas three saline-treated groups received either a similar administration of saline, morphine (3 mg/kg, i.p. ), or HLE (30 mg/kg, p.o.). Additionally, the group that was chronically treated with both morphine and HLE also received morphine (3 mg/kg, i.p.) 30 mins before formalin. Total nociceptive scores for treatment groups were analyzed using one-way ANOVA with drug treatment as a between-subjects factor. Whenever ANOVA was significant, further comparisons between vehicle- and drug-treated groups were performed using the Newman-Keuls test. where X is the logarithm of the dose and Y is the response. Y starts at a (the bottom) and goes to b (the top) with a sigmoid shape. The fitted midpoints (ED 50 s) of the curves were compared statistically using the F-test. , GraphPad Prism for Windows, version 4.03 (GraphPad Software, San Diego, CA, USA) was used for all statistical analyses and ED 50 determination. A P-value < 0.05 was considered statistically significant in all analyses. Preliminary phytochemical screening of HLE revealed the presence of saponins, tannins, glycosides, steroids, terpenoids as well as little amounts of flavonoids and alkaloids. Acetic acid injected intraperitoneally produced the characteristic response described above in control mice pretreated with physiological saline. [Table 1] represents the total number of writhes induced by acetic acid, during 20 min of observation, beginning 10 min after the i.p. injection. HLE (30-300 mg/kg, p.o., 1 h before) significantly reduced (F6, 25 = 8.84, P<0.0001, [Table 1]) the number of abdominal writhes over 20 min with a maximal inhibition of 70.60 ± 6.48% at the dose of 300 mg/kg. Similarly, the NSAID diclofenac (10-100 mg/kg, i.p., 30 min before) profoundly inhibited (F6, 25 = 8.84, P<0.0001, [Table 1]) the acetic acid-induced writhes by a maximum of 98.10 ± 1.90%. [Figure 1]a shows the dose-response curves for the inhibition of acetic acid-induced abdominal writhes in mice. HLE exhibited an inverted U-shaped dose-response relationship with ED 50 values of approximately 53.21 and 220.80 mg/kg. Generally, HLE was less potent than diclofenac (ED 50 = 13.81 ± 6.83 mg/kg). As shown by the time course curves in [Figure 2], all test drugs caused an increase in the tail withdrawal latency, calculated as %MPE. Two-way ANOVA (treatment΄ time) revealed a significant effect of drug treatments on the tail withdrawal latencies (HLE: F3, 112 = 9.90; P<0.0001; diclofenac: F3, 112 = 26.47; P<0.0001; and morphine: F3, 112 = 25.09; P<0.0001; [Figure 2]a, c, and e). HLE (30-300 mg/kg, p.o., 1 h before) increased the tail withdrawal latencies (F3, 15 = 3.918, P = 0.030; [Figure 2]b) with a significant effect at the dose of 30 mg/kg (P<0.05). Diclofenac (10-100 mg/kg, i.p.) elicited a significant antinociceptive activity by dose dependently increasing the tail withdrawal latencies of animals pretreated with it (F3, 16 = 6.804, P = 0.0036; [Figure 2]d). Morphine (1-10 mg/kg, i.p., [Figure 2]f) also showed similar effects (F3, 16 = 9.43, P = 0.0008). 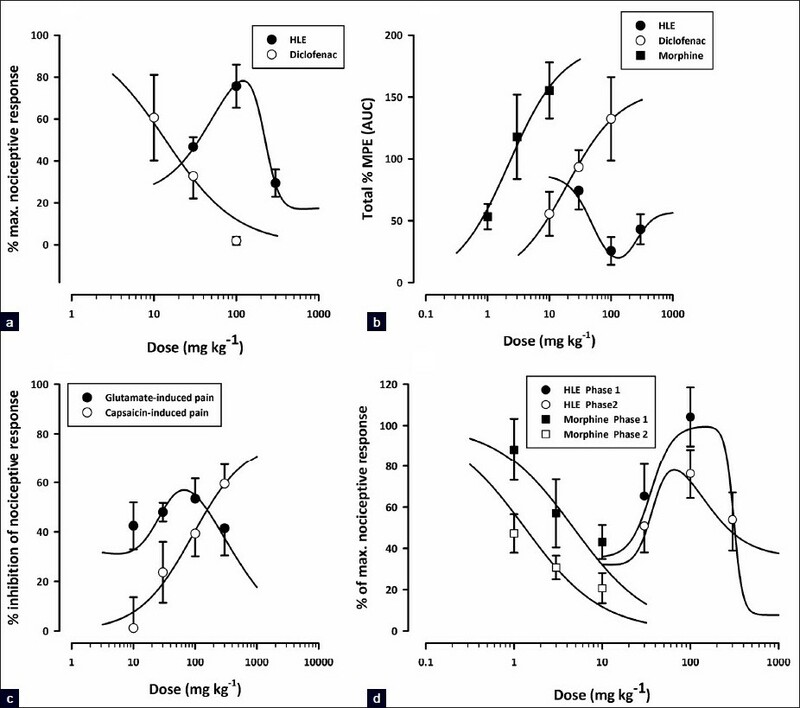 Dose-response curves for the antinociceptive effects of HLE, diclofenac, and morphine in the tail immersion test are shown in [Figure 1]b. HLE displayed a U-shaped dose-response relationship with ED 50 values of 56.86 and 156.68 mg/kg. By comparing the ED 50 values from the curves, HLE was significantly less potent than diclofenac (ED 50 19.18 ± 24.11 mg/kg) and morphine (ED 50 2.24 ± 2.35 mg/kg). 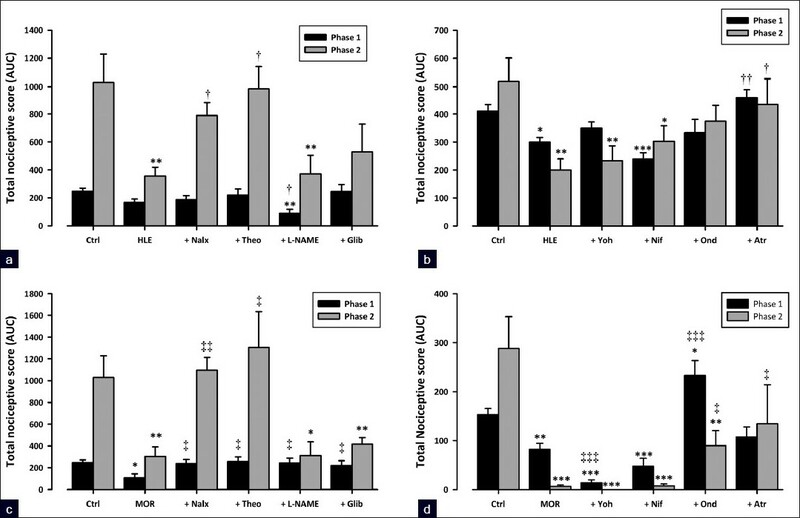 [Figure 3] shows the effect of pretreatment of HLE and morphine on formalin-induced pain in mice. All drug-treated groups displayed [Figure 3]a, c significant reduction in formalin-induced nociceptive behavior when compared with the vehicle-treated group [(HLE: F3, 192 = 3.92; P<0.05; morphine: F3, 192 = 15.29; P<0.0001; two-way ANOVA (treatment × time)]. The oral administration of HLE (30-300 mg/kg) 1 h before the injection of formalin inhibited both neurogenic (F3, 16 = 2.71; P = 0.0797, [Figure 3]b) and inflammatory (F3, 16 = 6.648; P = 0.0051, [Figure 3]b) phases of formalin-induced licking, though inhibition did not reach statistical significance in the neurogenic phase. Morphine (1-10 mg/kg, i.p. ), the positive analgesic control, produced marked dose-related inhibition of both the neurogenic (F3,16 = 3.531, P=0.039, [Figure 3]d) and inflammatory (F3, 16 = 15.54, P<0.0001, [Figure 3]d) pain phases. HLE (30-300 mg/kg) displayed an inverted U-shaped dose-response relationship as shown in [Figure 1]d. The ED 50 values were approximately 35.80 and 310.46 mg/kg for the first phase and 37.15 and 123.03 mg/kg for the second phase. The comparison of ED 50 s obtained by F-test [Figure 1]d revealed that the extract was more potent in the second phase than the first. Capsaicin induced a clear nociceptive response exhibited by biting and licking of the injected paw. The oral administration of HLE (30-300 mg/kg) 60 min before the intraplantar injection of capsaicin produced dose-dependent attenuation of capsaicin-induced neurogenic pain (F5, 24 = 10.21; P<0.0001, [Figure 4]a) with a maximal inhibition of 59.49 ± 7.89% at the dose of 300 mg/kg. Similarly, morphine (3 mg/kg, i.p., 30 min before) profoundly inhibited (F5, 24 = 10.21; P<0.0001, [Figure 4]a) the neurogenic pain by 84.07 ± 4.88%. [Figure 1]c shows the dose-response curves for the inhibition of capsaicin-induced neurogenic pain by HLE in mice. The ED 50 value from the nonlinear regression was 90 ± 116.76 mg/kg. [Figure 4]b shows the effects of HLE and morphine on glutamate-induced nociception. HLE (30-300 mg/kg, p.o., 1 h before glutamate, i.p.) produced dose-dependent inhibition of glutamate-induced pain (F5, 22 = 8.00; P<0.0002, [Figure 4]b) with a maximal inhibition of 53.41 ± 8.25% at the dose of 100 mg/kg. Similarly, morphine (3 mg/kg, i.p., 30 mins before) profoundly inhibited (F5, 22 = 8.00; P<0.0002, [Figure 4]b) the glutamate-evoked nocifensive behaviors by 92.22 ± 4.66 %. HLE exhibited an inverted U-shaped dose-response relationship [Figure 1]c with ED 50 values of 188.36 mg/kg and 28.58 mg/kg from the nonlinear regressional analysis. The results presented in [Figure 5]a show that the pre-treatment of mice with naloxone (2 mg/kg, i.p.) significantly reversed (P<0.05) antinociception by HLE (30 mg/kg, p.o.) in the inflammatory phase and had no effect on phase 1. Naloxone also significantly reversed the antinociception caused by morphine (3 mg/kg, i.p.) in both phases of formalin-induced pain (P<0.05 and P<0.01, respectively; [Figure 5]c). Previous treatment of the animals with theophylline (10 mg/kg, i.p.) significantly abolished the antinociception caused by HLE (30 mg/kg, p.o.) in the second phase of the formalin test (P<0.05; [Figure 5]a). Theophylline also completely reversed antinociception caused by morphine (3 mg/kg, i.p.) in both phases of the formalin test (P<0.05 and P<0.01, respectively; [Figure 5]c). Systemic pretreatment of mice with l-NAME (10 mg/kg, i.p.) or glibenclamide (8 mg/kg, p.o.) did not significantly prevent anti-nociception caused by HLE (30 mg/kg, p.o.) in both phases of the formalin test [Figure 5]a. However, both l-NAME and glibenclamide blocked morphine (3 mg/kg, i.p.) antinociception in the first phase (both P<0.05; [Figure 5]c). Ondansetron (0.5 mg/kg, i.p.) did not significantly block antinociception caused by HLE (30 mg/kg, p.o.) in both phases of the formalin test [Figure 5]d. In contrast, ondansetron significantly reversed the antinociception caused by morphine (3 mg/kg, i.p.) in both phases (P<0.001 and P<0.05, respectively; [Figure 5]b). Systemic pretreatment of mice with atropine (5 mg/kg, i.p.) completely reversed the antinociception caused by HLE (30 mg/kg, p.o.) in both phases of the formalin test (P<0.01 and P<0.05, respectively; [Figure 5]b). Atropine significantly abolished the antinociception caused by morphine (3 mg/kg, i.p.) in the second phase (P<0.05) but caused no significant change in the first [Figure 5]d.
Yohimbine (3 mg/kg, p.o.) and nifedipine (10 mg/kg, p.o.) did not significantly inhibit the antinociception caused by either HLE (30 mg/kg, p.o.) or morphine (3 mg/kg, i.p.) in both phases of the formalin test [Figure 5]b, d.
Morphine (3 mg/kg, i.p.) significantly attenuated nociceptive responses in both phases (F3, 16 = 27.87, P<0.0001, phase 1; F3, 16 = 5.41, P<0.01, phase 2; [Figure 6]b) of the formalin test in chronic vehicle-treated animals. However, the same dose of morphine administered at day 9 in animals chronically treated with morphine (6 mg/kg, i.p.) failed to show such effect indicating the development of tolerance [Figure 6]b. 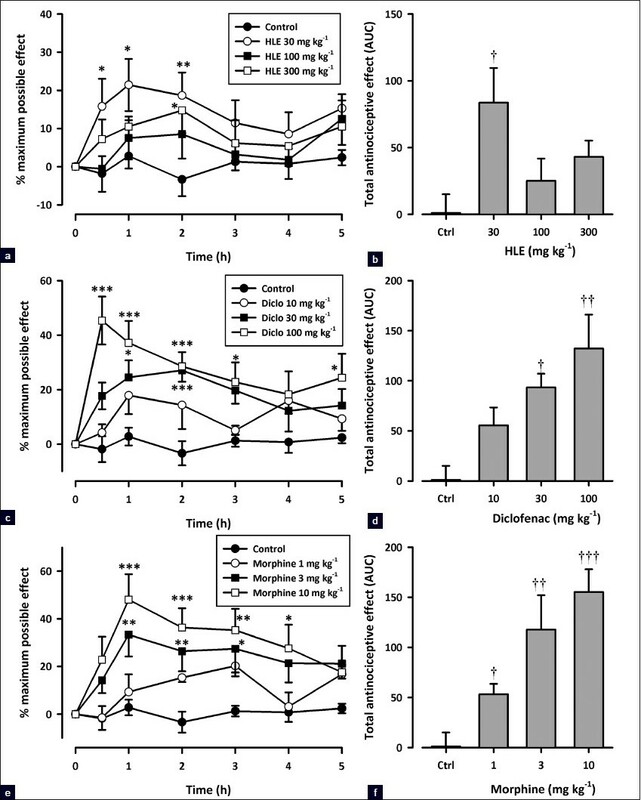 In contrast, the oral administration of 30 mg/kg HLE showed a comparable antinociceptive activity in mice given chronic treatment of either HLE 60 mg/kg, p.o., or vehicle, indicating the lack of tolerance development [Figure 6]a. Furthermore, HLE (30 mg/kg, p.o.) still demonstrated an antinociceptive activity in mice chronically treated with morphine (6 mg/kg, i.p. ), indicating that no cross-tolerance exists with morphine [Figure 6]a. Additionally, the repeated administration of HLE (60 mg/kg, p.o.) 30 min prior to each morphine (3 mg/kg, i.p.) injection to mice during the 8-day protocol significantly attenuated the development of tolerance to morphine [Figure 6]b. This study has demonstrated that the oral administration of the ethanolic extract of the aerial parts of H. latifolia exerts a significant antinociceptive activity against thermally (tail immersion) as well as chemically (acetic acid, glutamate, capsaicin, and formalin) induced nociception in mice. This antinociceptive effect was partly or wholly reversed by the systemic administration of the naloxone, theophylline, and atropine. Glibenclamide, ondansetron, yohimbine, nifedipine and l-NAME, however, did not significantly alter the antinociceptive effect of the extract. In order to obtain a full picture of the analgesic property of HLE, several behavioral animal models of nociception which differ with respect to stimulus quality, intensity, and duration were employed. The nociceptive tests were selected such that both peripherally and centrally mediated effects were investigated; in all, the extract showed a peripheral and central antinociceptive activity. The abdominal writhing test, a peritoneovisceral inflammatory pain model, is a very sensitive and convenient method for screening the antinociceptive effect of compounds. Although in terms of specificity, this method may have some insufficiencies (i.e., writhing may be suppressed by muscle relaxants and other nonanalgesic drugs, leaving scope for the misinterpretation of results),  it generally has a good correlation between the ED 50 values obtained in animals using this test and analgesic doses administered in man. The nociceptive effect induced in this model is easily prevented by nonsteroidal anti-inflammatory drugs, as well as by opioids and analgesics with central actions. HLE significantly inhibited the abdominal constriction induced by acetic acid in mice. The actions of acetic acid are known to be the indirect cause of the release of nociceptive endogenous mediators such as bradykinin, substance P, serotonin, histamine, sympathomimetic amines, prostaglandins (PGE 2 and PGF 2α), and proinflammatory cytokines such as tumor necrosis factor-α (TNF-α), interleukin-1β (IL-1β), and IL-8. ,,,, The inhibitory effects of HLE on inflammatory pain and abdominal constrictions produced after the administration of acetic acid in this study might therefore be said to be due to interference with the activation of nociceptors by one of these endogenous mediators. 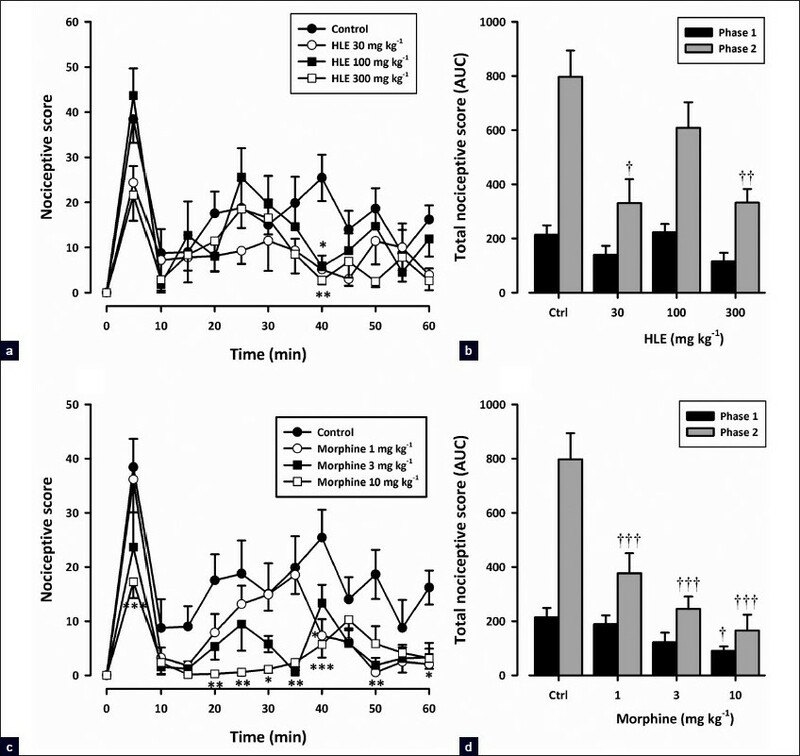 The antinociceptive effects of HLE, morphine, and diclofenac were confirmed by the use of a thermal nociceptive stimulation (tail immersion in a 48°C water bath). The tail immersion test, a variant of the tail-flick pain model, is a sensitive and particularly useful test for demonstrating dose-related activity. The effectiveness of analgesics in this model is also highly correlated with relief of human pain. HLE significantly attenuated thermal nociception in rats in this model, though not as effectively as morphine and diclofenac. The tail immersion test gives a response that is believed to be a spinally mediated reflex  but the mechanism of response could also involve higher neural structures. It is therefore suggested that HLE exerts its antinociceptive effects, at least in part, by spinally mediated central mechanisms. The formalin-induced paw pain, an in vivo model of persistent pain, is a valid model for analgesic study. It is undoubtedly the most predictive of acute pain  and very popular for the rapid and easy screening of pharmacological targets in drug evaluation. , HLE showed significant antinociceptive effects in this model. The formalin test produces a distinct biphasic nociceptive response. A first phase (neurogenic pain), occurring within seconds of formalin injection, is elicited by direct chemical activation of nociceptive primary afferent fibers. A second, later phase (inflammatory pain), occurs as a result of ongoing activity in primary afferents and increased sensitivity of dorsal horn neurons. ,, Therefore, the test can be used to clarify the possible mechanism of antinociceptive effect of a proposed analgesic. Centrally acting drugs, such as opioids, inhibit both phases equally;  however, many NSAIDs and corticosteroids inhibit only the late phase. HLE inhibited both phases of the formalin test but more effectively the second than the first. This implies that HLE is effective against both neurogenic and inflammatory pain. The inhibitory effect in the second phase also suggests an anti-inflammatory action of HLE. HLE, given orally, elicited a dose-dependent antinociceptive effect on the capsaicin-induced neurogenic paw-licking response. Capsaicin (8-methyl-N-vanillyl-6-nonenamide), the pungent algesic substance obtained from hot red chili peppers, is regarded a valuable pharmacological tool for studying a subset of mammalian primary sensory C-fibers and Ad afferent neurons including polymodal nociceptors and warm thermoceptors. It has been proposed that the capsaicin-induced nociception occurs as a result of the activation of the capsaicin (vanilloid) receptor, TRPV1, a ligand-gated nonselective cation channel present in primary sensory neurons. ,, The effect of HLE in this pain model suggests that HLE is effective against neurogenic pain in mice and its action may be due to an interaction with the capsaicin receptor (TPRV1). Results obtained in this study also show that the oral administration of HLE produced a significant inhibition of the nociceptive response caused by intraplantar injection of glutamate into the mouse hind paw. Glutamate, acting through a variety of receptors, plays an important role in peripheral and central pain transmission. Its intraplantar injection evokes thermal and mechanical hyperalgesia ,, as well as spontaneous lifting and licking behaviors in mice. The nociceptive response induced by glutamate appears to involve peripheral, spinal, and supraspinal sites of action and is largely mediated by both NMDA and non-NMDA receptors as well as by the release of nitric oxide or by some nitric oxide-related substance. The inhibitory capabilities of HLE by interference with the nociceptive response induced by glutamate, demonstrates, at least in part, an interaction of HLE with the glutamatergic system. The intraplantar injection of formalin, capsaicin, or glutamate is known to release endogenous chemical mediators such as neuropeptides, excitatory neurotransmitters, PGE 2 , NO, and kinins in the periphery and spinal cord that contribute to the nociceptive process. ,,,, Therefore, the suppression of the capsaicin-, formalin- and glutamate-induced licking response caused by treatment with HLE is a complementary indication that the antinociceptive action of this extract could be associated with its ability to inhibit the production or action of some of these mediators. With the exception of the capsaicin test, HLE showed a nonmonotonic dose-response pattern in all nociceptive tests used [Figure 1]. The exact biochemical mechanism underlying this pharmacological inversion is not yet clear and requires further studies to establish it. Nonetheless, the activation of various pathways at different doses of HLE may be responsible for the bell shape. In an attempt to further characterize some of the mechanisms through which HLE exerts its activity, the antinociceptive effect of HLE was assessed in the presence of various antagonists of notable mediators of the nociceptive pathway including naloxone, theophylline, l-NAME, glibenclamide, atropine, ondansetron, yohimbine, and nifedipine. The formalin test was selected for this study, since it is more specific and with its biphasic control of pain reflects different pathological processes and allows the elucidation of the possible mechanism involved in analgesia. Naloxone, a nonselective opioid antagonist significantly reversed the antinociceptive effect of HLE in the second phase suggesting a possible opioidergic involvement in the actions of HLE. The antinociceptive effects of HLE and morphine were reversed by theophylline implicating the involvement of the adenosinergic pathway in their actions. Adenosine acts at several P1 receptors (A 1 , A 2A , A 2B , and A 3 ) all of which are coupled to G proteins. The activation of A 1 receptors produce antinociception while the activation of A 2 and A 3 receptors produce pronociception. Since theophylline blocks adenosine A 1 and A 2 receptors, the antinociceptive effects may be due to the activation of A 1 receptors and/or an increment in endogenous adenosine either centrally or peripherally. The involvement of adenosine in morphine antinociception is well known ,, and has been confirmed in this study. The reversal of the antinociceptive effects of HLE by the nonselective muscarinic receptor antagonist, atropine, implicates the muscarinic cholinergic system in the actions of the extract. It is well reported that the activation of muscarinic receptors (M 1 -M 4 ) induces antinociception in various pain paradigms including thermal, inflammatory, and neuropathic pain. ,, Therefore, the antinociceptive effects of HLE may be due to the activation of one or more of the muscarinic receptors. Since glibenclamide (ATP-sensitive K + channel blocker), ondansetron (a 5-HT 3 receptor antagonist), yohimbine (a selective α2 -adrenoceptor antagonist), nifedipine (l-type VGCC blocker), and l-NAME (a selective inhibitor of NO biosynthesis) did not significantly alter the antinociceptive effect of the HLE, it is speculated that the extract's antinociceptive mechanism may not significantly involve ATP-sensitive K + channels, 5-HT 3 serotonergic receptors, α2 -adrenoceptors, l-type voltage-gated calcium channels, or the nitric oxide pathway. However, further pharmacological and chemical studies are necessary to characterize the precise mechanism(s) responsible for the antinociceptive action of HLE. Opioids, such as morphine, are clinically used primarily as analgesics. But the development of tolerance that necessitates dose escalation regardless of disease progression greatly limits their effectiveness and usage. , Since the present study revealed the possible involvement of the opioidergic pathway in the antinociceptive activity of HLE, a study was carried out to determine if the repeated administration of HLE could lead to the development of analgesic tolerance. The study further determined if morphine tolerance could cross-generalize to HLE and whether the concurrent administration of morphine and HLE could abolish morphine tolerance. The results suggest that, unlike morphine, HLE does not induce tolerance in its anti-nociceptive effect after chronic administration in the formalin test. In fact, HLE was even more effective after chronic administration. The lack of tolerance development after HLE treatment cannot be attributed to the use of a low dose, because HLE was chronically administered at the dose maximally active in the late phase of formalin-induced pain. In view of the opioidergic activity of HLE without tolerance development, it is suggested that HLE might have components acting via pathways that interfere with the mechanism of opioid tolerance development. This view is supported by the fact that HLE attenuated the development of morphine tolerance in this current study. Another interesting finding is that morphine tolerance does not cross-generalize to HLE, implying that the extract can be used to treat pain in opioid-tolerant individuals. In conclusion, the current study demonstrates that the ethanolic extract of the aerial parts of H. latifolia has antinociceptive activity in chemical and thermal models of nociception without inducing tolerance. The antinociceptive effect involves an interaction with adenosinergic, muscarinic cholinergic, and opioid pathways. The authors are grateful for the technical assistance offered by Messrs Thomas Ansah, Gordon Darku, and Prosper Akortia of the Department of Pharmacology, Faculty of Pharmacy and Pharmaceutical Sciences, KNUST, Kumasi, Ghana. 1. Jagerovic N, Cano C, Elguero J, Goya P, Callado LF, Meana JJ, et al. Long-acting fentanyl analogues: Synthesis and pharmacology of N-(1-phenylpyrazolyl)-N-(1-phenylalkyl-4-piperidyl)propanamides. Bioorg Med Chem 2002;10:817-27. 2. Rang HP, Dale MM, Ritter JM, Flower RJ, editors. Rang and Dale's Pharmacology. Edinburgh: Churchill Livingstone; 2007. 3. Mshana NR, Abbiw DK, Addae-Mensah I, Adjanohoun E, Ahyi MRA, Ekpere JA, et al. Traditional Medicine and Pharmacopoeia. Contribution to the Revision of Ethnobotanical and Floristic Studies in Ghana. 1 st ed. Accra: Organization of African Unity/Scientific, Technical and Research Commision; 2000. 4. Dokosi OB. Herbs Of Ghana. 1 st ed. Accra: Ghana Universities Press; 1998. 5. Trease GE, Evans WC. A Textbook of Pharmacognosy. 13 th ed. London: Baillière Tindall; 1989. 6. Gonzalez-Trujano ME, Pena EI, Martinez AL, Moreno J, Guevara-Fefer P, Deciga-Campos M, et al. Evaluation of the antinociceptive effect of Rosmarinus officinalis L. using three different experimental models in rodents. J Ethnopharmacol 2007;111:476-82. 7. Koster R, Anderson M, Beer EJ. Acetic acid for analgesic screening. Fed Proc 1959;18:412-8. 8. Sewell RD, Spencer PS. Antinociceptive activity of narcotic agonist and partial agonist analgesics and other agents in the tail-immersion test in mice and rats. Neuropharmacology 1976;15:683-8. 9. Dubuisson D, Dennis SG. The formalin test: A quantitative study of the analgesic effects of morphine, meperidine, and brain stem stimulation in rats and cats. Pain 1977;4:161-74. 10. Hunskaar S, Hole K. The formalin test in mice: Dissociation between inflammatory and non-inflammatory pain. Pain 1987;30:103-14. 11. Hayashida K, Takeuchi T, Shimizu H, Ando K, Harada E. Lactoferrin enhances opioid-mediated analgesia via nitric oxide in the rat spinal cord. Am J Physiol Regul Integr Comp Physiol 2003;285:R306-12. 12. Beirith A, Santos AR, Rodrigues AL, Creczynski-Pasa TB, Calixto JB. Spinal and supraspinal antinociceptive action of dipyrone in formalin, capsaicin and glutamate tests. Study of the mechanism of action. Eur J Pharmacol 1998;345:233-45. 13. Beirith A, Santos AR, Calixto JB. Mechanisms underlying the nociception and paw oedema caused by injection of glutamate into the mouse paw. Brain Res 2002;924:219-28. 14. Meotti FC, Luiz AP, Pizzolatti MG, Kassuya CA, Calixto JB, Santos AR. Analysis of the antinociceptive effect of the flavonoid myricitrin: evidence for a role of the L-arginine-nitric oxide and protein kinase C pathways. J Pharmacol Exp Ther 2006;316:789-96. 15. Villetti G, Bergamaschi M, Bassani F, Bolzoni PT, Maiorino M, Pietra C, et al. Antinociceptive activity of the N-methyl-D-aspartate receptor antagonist N-(2-Indanyl)-glycinamide hydrochloride (CHF3381) in experimental models of inflammatory and neuropathic pain. J Pharmacol Exp Ther 2003;306:804-14. 16. Miller JR. GraphPad Version 4.0. Step-by-Step Examples. San Diego, CA: GraphPad Software Inc.; 2003. 17. Motulsky HJ, Christopoulos A. Fitting model to biological data using linear and nonlinear regression. A practical guide to curve fitting. San Diego, CA: GraphPad Software Inc.; 2003. 18. Sakiyama Y, Sujaku T, Furuta A. A novel automated method for measuring the effect of analgesics on formalin-evoked licking behavior in rats. J Neurosci Methods 2008;167:167-75. 19. Abbott FV, Franklin KB, Westbrook RF. The formalin test: Scoring properties of the first and second phases of the pain response in rats. Pain 1995;60:91-102. 20. Wang YX, Bowersox SS, Pettus M, Gao D. Antinociceptive Properties of Fenfluramine, a Serotonin Reuptake Inhibitor, in a Rat Model of Neuropathy. J Pharmacol Exp Ther 1999;291:1008-16. 21. Hayashida K, Takeuchi T, Shimizu H, Ando K, Harada E. Lactofering enhances opioid-mediated analgesia via nitric oxide in the rat spinal cord. Am J Physiol Regul Integr Comp Physiol 2003;285:R306-12. 22. Le Bars D, Gozariu M, Cadden SW. Animal models of nociception. Pharmacol Rev 2001;53:597-652. 23. Collier HOJ, Dinneen LC, Johnson CA, Schneider C. The abdominal constriction response and its suppression by analgesic drugs in the mouse. Br J Pharmacol Chemother 1968;32:295-310. 24. dos Santos DA, Fukui Mde J, Dhammika Nanayakkara NP, Khan SI, Sousa JP, Bastos JK, et al. Anti-inflammatory and antinociceptive effects of Baccharis dracunculifolia DC (Asteraceae) in different experimental models. J Ethnopharmacol 2010;127:543-50. 25. Deraedt R, Jouquey S, Delevallée F, Flahaut M. Release of prostaglandins E and F in an algogenic reaction and its inhibition. Eur J Pharmacol 1980;61:17-24. 26. Duarte ID, Nakamura M, Ferreira SH. Participation of the sympathetic system in acetic acid-induced writhing in mice. Braz J Med Biol Res 1988;21:341-3. 27. Ikeda Y, Ueno A, Naraba H, Oh-ishi S. Involvement of vanilloid receptor VR1 and prostanoids in the acid-induced writhing responses of mice. Life Sci 2001;69:2911-9. 28. Ribeiro RA, Vale ML, Thomazzi SM, Paschoalato AB, Poole S, Ferreira SH, et al. Involvement of resident macrophages and mast cells in the writhing nociceptive response induced by zymosan and acetic acid in mice. Eur J Pharmacol 2000;387:111-8. 29. Grumbach L. The prediction of analgesic activity in man by animal testing. In: Knighton RS, Dumke PR, editors. Pain. Boston: Little Brown and Co; 1966. p. 163-82. 30. Chapman CR, Casey KL, Dubner R, Foley KM, Gracely RH, Reading AE. Pain measurement: an overview. Pain 1985;22:1-31. 31. Jensen TS, Yaksh TL. Comparison of antinociceptive action of morphine in the periaqueductal gray, medial and paramedial medulla in rat. Brain Res 1986;363:99-113. 32. Saddi G-M, Abbott FV. The formalin test in the mouse: A parametric analysis of scoring properties. Pain 2000;89:53-63. 33. Vissers K, Hoffmann V, Geenen F, Biermans R, Meert T. Is the second phase of the formalin test useful to predict activity in chronic constriction injury models? A pharmacological comparison in different species. Pain Pract 2003;3:298-309. 34. Tjolsen A, Berge OG, Hunskaar S, Rosland JH, Hole K. The formalin test: an evaluation of the method. Pain 1992;51:5-17. 35. Munro G. Pharmacological assessment of the rat formalin test utilizing the clinically used analgesic drugs gabapentin, lamotrigine, morphine, duloxetine, tramadol and ibuprofen: Influence of low and high formalin concentrations. Eur J Pharmacol 2009;605:95-102. 36. Shibata M, Ohkubo T, Takahashi H, Inoki R. Modified formalin test: characteristic biphasic pain response. Pain 1989;38:347-52. 37. Jancsó G. Pathobiological reactions of C-fibre primary sensory neurones to peripheral nerve injury. Exp Physiol 1992;77:405-31. 38. Tominaga M, Caterina MJ, Malmberg AB, Rosen TA, Gilbert H, Skinner K, et al. The cloned capsaicin receptor integrates multiple pain-producing stimuli. Neuron 1998;21:531-43. 39. Caterina MJ, Schumacher MA, Tominaga M, Rosen TA, Levine JD, Julius D. The capsaicin receptor: A heat-activated ion channel in the pain pathway. Nature 1997;389:816-24. 40. Szallasi A, Blumberg PM. Vanilloid (Capsaicin) receptors and mechanisms. Pharmacol Rev 1999;51:159-212. 41. Neugebauer V. Glutamate receptor ligands. Handb Exp Pharmacol 2007;177:217-49. 42. Jackson DL, Graff CB, Richardson JD, Hargreaves KM. Glutamate participates in the peripheral modulation of thermal hyperalgesia in rats. Eur J Pharmacol 1995;284:321-5. 43. Carlton SM, Hargett GL, Coggeshall RE. Localization and activation of glutamate receptors in unmyelinated axons of rat glabrous skin. Neurosci Lett 1995;197:25-8. 44. Carlton SM, Chung K, Ding Z, Coggeshall RE. Glutamate receptors on postganglionic sympathetic axons. Neuroscience 1998;83:601-5. 45. Santos AR, Calixto JB. Further evidence for the involvement of tachykinin receptor subtypes in formalin and capsaicin models of pain in mice. Neuropeptides 1997;31:381-9. 46. Sakurada T, Sugiyama A, Sakurada C, Tanno K, Sakurada S, Kisara K, et al. Involvement of nitric oxide in spinally mediated capsaicin- and glutamate-induced behavioural responses in the mouse. Neurochem Int 1996;29:271-8. 47. Sakurada T, Matsumura T, Moriyama T, Sakurada C, Ueno S, Sakurada S. Differential effects of intraplantar capsazepine and ruthenium red on capsaicin-induced desensitization in mice. Pharmacol Biochem Behav 2003;75:115-21. 48. Fredholm BB, IJzerman AP, Jacobson KA, Klotz KN, Linden J. International Union of Pharmacology. XXV. Nomenclature and classification of adenosine receptors. Pharmacol Rev 2001;53:527-52. 49. Sawynok J. Adenosine receptor activation and nociception. Eur J Pharmacol 1998;347:1-11. 50. Sawynok J, Liu XJ. Adenosine in the spinal cord and periphery: Release and regulation of pain. Prog Neurobiol 2003;69:313-40. 51. Ribeiro JA, Sebastiao AM, de Mendonca A. Adenosine receptors in the nervous system: pathophysiological implications. Prog Neurobiol 2002;68:377-92. 52. Sanders RD, Maze M. Adrenergic and cholinergic compounds. Handb Exp Pharmacol 2007;177:251-64. 53. Jones PG, Dunlop J. Targeting the cholinergic system as a therapeutic strategy for the treatment of pain. Neuropharmacology 2007;53:197-206. 54. Honda K, Harada A, Takano Y, Kamiya H. Involvement of M3 muscarinic receptors of the spinal cord in formalin-induced nociception in mice. Brain Res 2000;859:38-44. 55. Chen Y, Geis C, Sommer C. Activation of TRPV1 contributes to morphine tolerance: Involvement of the mitogen-activated protein kinase signaling pathway. J Neurosci 2008;28:5836-45. 56. Tang L, Shukla PK, Wang LX, Wang ZJ. Reversal of morphine antinociceptive tolerance and dependence by the acute supraspinal inhibition of Ca(2+)/calmodulin-dependent protein kinase II. J Pharmacol Exp Ther 2006;317:901-9. Woode, E. and Amoh-Barimah, A.K. and Abotsi, W.K.M. and Ainooson, G.K. and Owusu, G.
Freitas, A.C.C. and Ximenes, N.C.A. and Aguiar, J.S. and Nascimento, S.C. and Lins, T.U.L. and MagalhÃ£es, L.R. and Coelho, L.C.B.B. and Carneiro-Da-Cunha, M.G. and GonÃ§alves-Silva, T. and Correia, M.T.S.